Eight years after his smashing debut feature, Attack the Block, we finally have Joe Cornish's followup, and it's a corker. 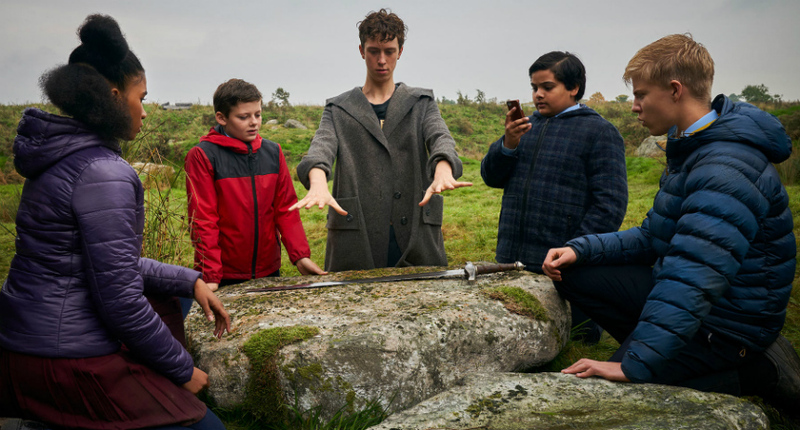 It's a PG-rated family film, and it's another telling of the King Arthur legend, albeit in modern times with young people in the lead roles, and that combination may have put genre fans off its trail. But it definitely has the same energy and fresh vibe that Cornish brought to his first film, which makes me think it better be described as "Attack the Block, only with kids fighting sorcery rather than aliens." Louis Ashbourne Serkis -- yes, Andy Serkis' son -- plays the lead role of Alex with great spirit and gumption. He and his best buddy must team up with school bullies in order to fight against an army of spirits led by Morgana (Rebecca Ferguson, unrecognizable). Merlin (Patrick Stewart) acts as advisor, though he takes on the guise of a young fish out of water in the form of Angus Imrie, who adds great wit through his body language and gestures. The action scenes are wonderfully choreographed, the young actors do just fine with their roles, and it finishes up with a series of sequences that are a sheer delight to behold. It's a swashbuckling, sweeping adventure and you'll want to see it on the biggest screen possible, even if you have to kowtow to your wife's sister's husband and beg to see it on his big honking TV. James McAvoy, Bruce Willis, Anya Taylor-Joy, Sarah Paulson, and Samuel L. Jackson star in a suspense drama that is occasionally enlivened with action scenes. As I wrote in my review: "Playing like a lesser sequel to the painfully slow-moving Unbreakable (2000), as well as failing to live up to the more dynamic Split, M. Night Shyamalan's Glass concludes a comic-book movie trilogy with much extended exposition and very few, if any, surprises, adding up to an experience filled with earnest lethargy and aimless disappointment." Here's a Keanu Reeves joint I haven't seen yet, also starring Alice Eve and Thomas Middleditch. Reeves plays a scientist who wants to bring his family back to life after they die. Will things go well? An educated guess: no. Summing up: Reviews were brutal and it may well be an awful experience. Of course, all these factors make me sufficiently curious to rent it.